Attention from the medias and the clubs is in great demand. International bands are fighting for it – but nevertheless, the bunch of Danish bands on tour in North America have succeeded in attracting attention to themselves. The main reason for the ”Danish invasion” is SxSw, the grand scale conference and festival event in Austin, Texas, which is being held these days. But several of the Danish arrangements have drawn full houses before this: this Monday, record company Crunchy Frog introduced three of its acts at Mercury Lounge in New York: Superheroes, Junior Senior and Sweedish The Mopeds. The Mercury Lounge with its total capacity of 200 seats was jam-packed. Almost half of the audience was estimated to be from the music business, but this did not stand in the way of an enthusiastic applause – also from the many A&R’s – especially for the two Danish bands. After this, the Danish stand at the Texas Festival has experienced a growing interest for the two acts, says Nils Åkesson, ROSA, participating in the joint Danish-Norwegian showcase. Also American publishers, magazines and both college radio and tv have shown interest – not at least in Saybia, by the way, who gave a concert this Tuesday in Toronto, Cananda. Thursday, the first chapter of the Danish story at this year’s SxSw took place: the Crunchy Frog showcase at the venue Friends with Junior/Senior as the main attraction, followed by The Tremolo Beer Gut, The Mopeds and PowerSolo. This event attracted much attention from journalists and photographers – among others from The Austin Cronicle and The New York Times. Danish and Scandinavian music is really hot. 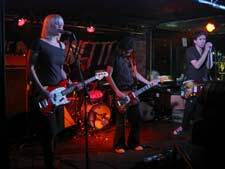 This also could be experienced at the Empire in Austin this Thursday, where The Raveonettes played to a packed house” with amazingly many representatives from the music business”, as puts it Nils Åkesson. in the US right now. The Raveonettes are smoking hot in USA just now, and this is reflected in the ticket and CD sale in connection with their actual seven weeks’ tour in USA – and rumour has it that the Dave Letterman Show has been asking for them. Another rumour: The Raveonettes will be warm-up band for British Blur on their upcoming tour.